This recipe for Russian beetroot soup or borshch is made with beef, cabbage, carrots, potatoes, onion, and beets. Turnips and other root vegetables can be added if desired. Contrary to popular belief, Russians don't spell their beetroot soup borscht (that's a Yiddish spelling) and it's really not a Russian invention (the Ukrainians claim it as theirs). Nor are beets the predominant ingredient in Russian borshch. That's probably why this stew-like soup is orange from the carrots and tomato paste, not red. Poles call their beet soup barszcz and it has the ruby-red color most people associate with beet soup. 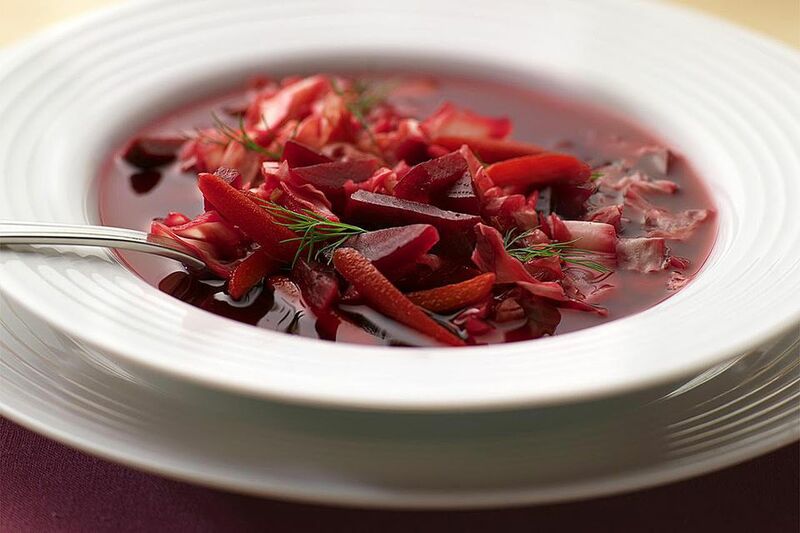 Russians call their cold beet soup, which is very red in color, ​svekoljnik. In Ukraine, beet soup is made in infinite varieties, but some resemble the Russian version and are also called borshch. This soup is excellent with little pirozhki (similar to pierogi), or Ukrainian Caraway Dumplings cooked right in the broth. But it's delicious without them. To make the beef stock: Combine beef and water in a stockpot over medium heat. Bring to a boil, reduce heat and simmer gently. Skim top surface until impurities no longer appear, about 30 minutes. Add onion, carrot, celery and tie stock sachet to pot handle and drop into pot. Simmer, covered, for 1 hour or until meat falls off the bone, adding water as needed to cover. Pull up on stock sachet string and remove. Remove beef to a bowl and pull the meat off the bones, chop into bite-sized pieces, and set aside. Strain stock into a clean, heatproof container, pressing on vegetables to obtain maximum flavor. Discard vegetables. To make the soup: Cook the beets and carrots in the beef stock, covered, until tender, about 45 minutes. Remove from broth, let cool and then coarsely shred. Set aside. While beets and carrots are cooling, add cabbage, onion, and potatoes to the broth. Bring back to a boil and simmer 20 minutes, covered, or until tender. Add beets and carrots, tomato paste, and salt and pepper to taste. If serving with caraway dumplings, drop the batter into the soup at this point. To make the caraway dumplings: In a small bowl, whisk together flour, baking powder, salt and caraway seeds. In a separate bowl, whisk together milk and beaten egg. Add to flour mixture and blend with a fork until a stiff, sticky batter results. Using a tablespoon or a small cookie scoop, transfer batter to simmering (not boiling) soup. Cover and let steam 5 minutes. Turn dumplings over and steam another 5 minutes, covered. Add the reserved meat to soup and heat through. Serve in warmed bowls with a dollop of sour cream, fresh dill, and a lemon wedge, if desired.